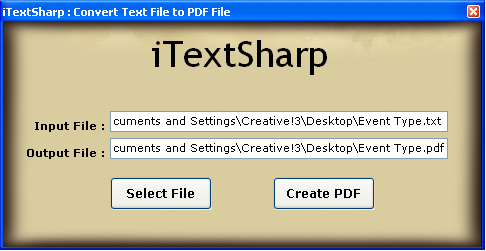 The Blog demonstrate a method to convert the text files into PDF files using iTextSharp PDF library. #1: StreamReader class provides an access to read the data from Stream such as Text File. #2: Documentclass allows creating a new instance for Creating PDF File. #3: PdfWriter class, an instantaneous access to write a PDF document from an object of Document class. Here I implemented the Code for converting Text Document into PDF Document using iTextSharp Tool. 1. Select the Text File (code for “Select File” Button). 2. Convert Text File into a PDF File (code for “Create PDF” Button). 3. Now execute the Application and see the result (Figure 1). In this piece of writing, using C# environment, we have seen how to convert the Text file into PDF file using iTextSharp Tool (A free PDF library ported from Java iText).